Make it difficult for defenders! Do your players understand the importance of making quality attacking runs? They should, and so should you! They can make it very difficult for defenders to prevent goal scoring opportunities. - Set up these attacking runs with 2 lines roughly 25-30 yards from goal. - Have 1-2 players on each side near the sideline for optimal width. - Balls begin with the players in the 2 lines. 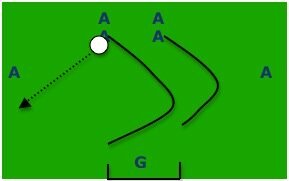 - 1 player plays a firm, quality pass to the player near the sideline. - 1st player in each of the 2 lines make runs towards the goal. - Wide player takes 1 touch to take the ball down the line towards the goal line and uses 2nd to cross the ball into the box. - 1 player makes a run to the near post, 1 to the far post looking for a shot on goal from the cross. - Alternate sides for each cross. - Passes wide should be "game like" meaning firm and accurate. - Wide player should attack space down the line with 1st touch with a good chance of pace. - Attacking runs should be in a "banana" shaped run into the box. This is imperative for success. NO STRAIGHT RUNS! By running away from the ball first causes the defender to have to take his/her eyes off of the ball to look and find where the attacker is, giving the attack an edge. - As the 2 attackers approach the goal they should "explode" with a change of pace again increasing difficulty for defender to follow both player and ball. - Just prior to the cross the players should accelerate towards their ending spot. - One should always go near, and one to the far post. The far post player should finish the run roughly 5 yards shallower, meaning if near post player ends the run at the 6 yard box, the back post should finish the run even with the penalty spot. This provides depth to your attack. - Add 1 defender for the cross, have that defender pick 1 player to cover and leave the other free. This forces the players to communicate where they want the cross, and forces the crosser to look up and be accurate!. - Add a 2nd defender to make very difficult. This forces the attackers to time their runs as well as their change of pace precisely to have success. - 10-15 minutes for these soccer attacking runs.